Cathy and Andy had their wedding and wedding reception at Deer Park Hall, one of my favourite wedding venues in Worcestershire. The panelled room in which they had the wedding service was also used for the evening reception, and the photo here shows the bride and groom taking their first dance together as husband and wife. I really enjoy working at Deer Park. The dark wood on the walls provides a great background for first dance photos when you light the bride and groom with a well placed flash. My favourite thing about this wedding is the expression on Cathy's face, it's a look of sheer joy that I was lucky to capture on film. 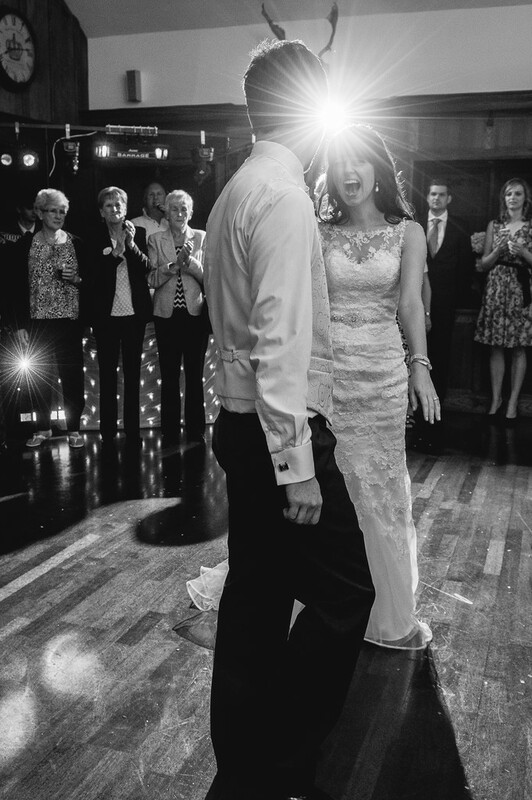 Another thing that makes this image really work for me is simply the timing; I had flashes set up around the room to provide a little fill-in light, but at the exact moment this photo was taken, the disco lights pointed straight into my lens and created this amazing star burst effect that you can see here. I chose to make this image black and white as the disco lights weren't colour-free as you see them here. Bright green and pink spots don't always make for the best wedding photos, but removing colour completely allows the viewer to focus on the important bits of this image - the bride, groom and the raw emotion that makes documentary wedding photography so powerful.